HDTV enhances viewing experience with a screen resolution of 1920 by 1080 pixels in 16:9 aspect ratio, a 5 times increase in pixel resolution. 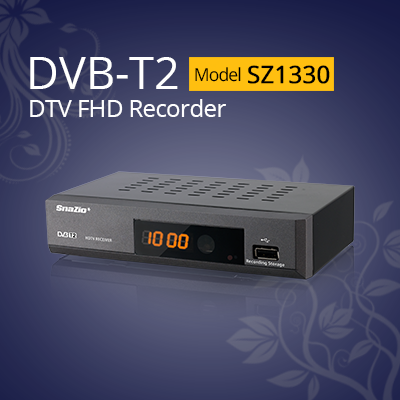 SnaZio* DTV Full HD Recorder has incorporated many advanced features to enhance user experience. These includes multi-channel viewing, Electronic Program Guide (EPG) to access and to schedule viewing and TV recording. Recording can be done instantly, by duration, by setting a repeatable schedule or using the time shifting function to pause and continue after taking a break. All recordings are done on a simple USB storage which can be unplugged for viewing on other TV sets, PC, mobile, tablet or other digital devices. It also works as your media player for music, video and photo from your USB device or mobile devices. It supports multiple languages including English, Chinese, Malay and with options to include Tamil in future upgrades. Viewer can select subtitle language or audio channels including surround sound broadcasts via SPDIF digital audio output. There is even games included. Firmware is fully upgradeable for future enhancements. It represents V One Multimedia commitment to bring you ahead of the curve.